Join us on this 2.5 hour tour where will you soak up the sun in luxury! We will take you to see some of the beautiful sights of the Bahamas including a reef where you will see many coloful marine species that live there. Our yacht is equipped with all the comforts you need so climb aboard and enjoy the smooth ride over. On the ride over, you will enjoy tasty appetizers and cold drinks to keep you refreshed. Once we arrive at the Taino Beach, you will be able to relax or snorkel in the water. You will be delighted with everything there is to see! After, you will enjoy a filling, unlimited lunch buffet including pasta, seafood, fresh fruit, and more. Once you eat as much as your heart desires, enjoy an unlimited open bar featuring beer, wine, and spirits while you enjoy the views on the ride back. 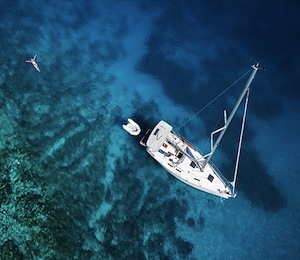 I have been to the Bahamas many times, but Luxury Day Sailing is one of my favorite trips! It includes everything that everyone should do here. As a Bahamas veteran, I can say only the best about this experience!